← Who gave Santa all that Oil? Buzz Aldrin setting up a seismic detector in 1969 – the solar systems’s first luno-phone. NASA has reprocessed the Apollo missions’ old lunar seismic data. The data is from 1969 through 1977, the latter being recorded by equipment still active long after the last astronaut went home. This is old seismic data. Reprocessed, it tells new stories. In my own work, I have reprocessed ancient earthly seismic data (some from the 1950s!) and found similarly dramatic improvements. Such data sets are sharper, clearer, better focussed. In recent years, powerful computers and tremendously improved algorithms have made old data sing and dance. In the case of the lunar seismic, we now have a clearer picture of the Moon’s crust, mantle, and core. The lucky American men on the moon shot explosives ranging up to 2.5 kilos (5 pounds) at the lunar surface, sometimes using thumpers, other times launching mini-grenades. Their geophones (luno-phones ???) were often poked in straight lines, much as scientists have done during earthly oil exploration in places like Siberia and downtown Los Angeles. At first, the lunar tests yielded little more than shallow results. But apparently, the record-lengths were several seconds longer than needed to acquire data limited to just describing near-surface lunar horizons. Now the parts of the seismic records that picked up reflections bouncing from the core have also been reprocessed and reexamined. Renee Weber, a space scientist at NASA’s Marshall Space Flight Center (Huntsville, Alabama), said that her team applied modern seismology techniques developed for terrestrial data “to this legacy data set to present the first-ever direct detection of the moon’s core.” This is big news because it revealed a big surprise. Choco-earth; choco-moon: both are equally edible. The big surprise (to me at least) is the similarity between Earth and Moon innards. The NASA team is suggesting that the Moon possesses a solid inner core of iron-rich material. The lunar inner core is surrounded by a squishy outer core, much like the Earth itself has. And much like a good-quality chocolate-covered cherry. Should you ever have trouble remembering the phases of the inner-earth, imagine a choco-cherry. 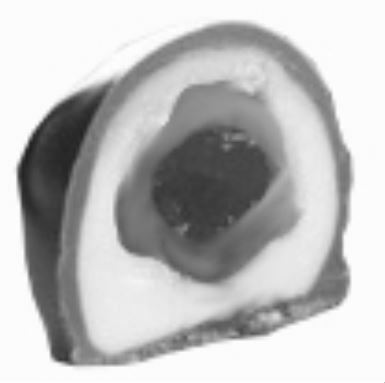 Think of the solid cherry (the inner core) of the candy, surrounded by gooey liquid (the outer core), then the creamy white fondant (mantle), topped with a thin chocolate layer (the crust). The proportions are off, but the order and state of the material is right. It appears that the Moon has the same general internal structure. Maybe with one deviation, which we will come to in a moment. So, here’s the big picture: The Moon has an Earth-ish interior. First, a 240-km radius iron inner core. Then, up to 330-km, a liquid outer core. Next, something unearthly, sort of out-of-this-world, if you will. The Moon has a sloppy molten layer surrounding the outer core. It seems to hold some interesting elements, such as sulphur, perhaps even calcium and cheese mold. Beyond that is a conventional rocky plasticized mantle and then a basaltic crust. Below, you can see a side-by-side Earth-Moon comparison. Earlier, I mentioned that seismic data was recorded on the Moon until 1977. The last Apollo mission was in 1972. 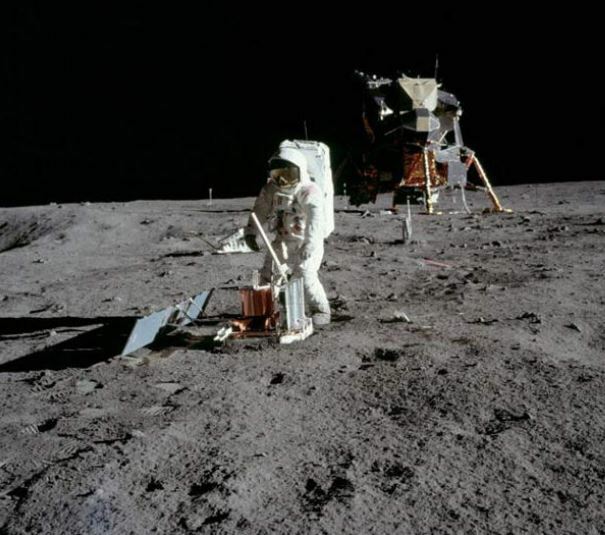 With no men on the moon to thump thumpers and lob grenades, the seismic equipment went into a passive phase, but continued to transmit seismic records intermittently for another five years. The energy source after the humans went home was mostly meteor impacts which sent shock waves echoing through the lunar depths. These were sometimes large energy bursts. Falling rocks powered low-frequency seismic waves which can travel farther and deeper and allow better signal-to-noise ratios from boundaries between the lower mantle and the lunar core. Earth, left, Moon, right: their cores are showing. This entry was posted in History, How Geophysics Works, Space and tagged earthquakes, geophysics, history, inner Earth, seismic recording, The Moon. Bookmark the permalink. 1 Response to Who’s Got Mantle?